Britain's Simon Yates says he wants to "finish the job off" when he returns to the Giro d'Italia in 2019. The 26-year-old led the race for 13 days in May but lost the leader's jersey to eventual winner Chris Froome on stage 19 of the 21-stage race. 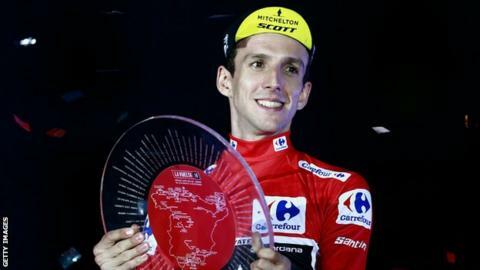 Yates, who rides for Mitchelton-Scott, went on to win his first Grand Tour at the Vuelta a Espana in September. "It's a race I have great memories from but one which also left a bitter taste in my mouth," Yates said of the Giro. "I want to go back to try to finish the job off." Yates claimed three stage victories in the 2018 edition and came within two days of winning the title. However, he lost almost 39 minutes when Froome attacked on the Colle delle Finestre, falling from first to 17th in the general classification, and eventually finished 22nd. "The Giro is always an extremely difficult race and next year, with three time trials, it's maybe not perfectly suited to me," said Yates, who is a climbing specialist. "We will still give it a real go and see what we can achieve." Mitchelton-Scott sports director Matt White said he had "a gut feeling" that Yates would return to the Giro. "He will return with the self-assurance that he's been there and he and the team know they can win a Grand Tour," White added. "Regardless of who is on the start line, Simon will go in as one of the favourites and we're comfortable with that." The 102nd edition of the Giro d'Italia begins on 11 May with an 8km time trial in Bologna that ends with a 2km climb to the finish line. British riders won all three Grand Tours in 2018, with BBC Sports Personality of the Year Geraint Thomas, claiming the Tour de France title.